The NFL preseason is underway and a few Alabama rookies got their feet wet Thursday night. Rolando McClain had two tackles including one solo for the Oakland Raiders 17-9 win over the Cowboys. Even more impressive was Terrence Cody. 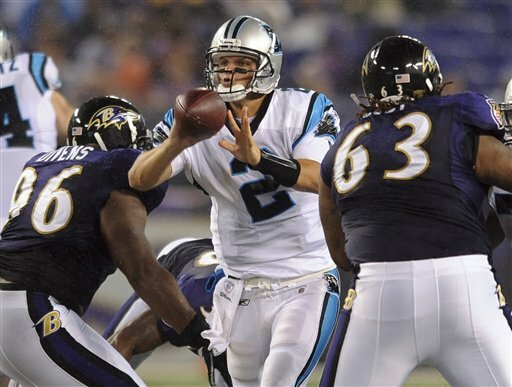 He had five tackles — four solo — and one for loss in the Ravens’ 17-12 win over the Panthers. He even lined up in the backfield as a fullback blocking for another former McClain from Alabama — running back Le’Ron McClain. Read more about Cody’s blocking skills in the Baltimore Sun. In Foxboro, Brandon Deaderick got a little playing time in the Patriots’ 27-24 loss to the Saints. Deaderick had one tackle in the fourth quarter. Barely escaping the title of “Mr. Irrelevant,” former Tide defensive end Brandon Deaderick became the seventh Alabama player taken in the NFL draft when the New England Patriots took him with the 247th pick. Only eight players followed Deaderick. The seven picks makes this the most Alabama-heavy draft since it shrunk from 12 rounds to seven in 1993. Still, several hopefuls went undrafted including Lorenzo Washington, Leigh Tiffin, Colin Peek and Justin Woodall. Stay tuned for any free agent news. Before jumping back on the road, here are a few tidbits from Wednesday’s press briefing. The status of Brandon Deaderick for Saturday’s game is still unknown since he’s in Kentucky mourning the death of his grandmother. Mark Ingram did not practice again Wednesday because of the flu. Running back Terry Grant has been working out with the wide receivers in practice this week. That is the quick version of what’s going on. Read the paper Thursday and Friday to read, what Paul Harvey would have called, the rest of the story. Speaking on his weekly radio show, Nick Saban said the Alabama medical staff cleared Brandon Deaderick to return to practicing at full speed. Whether or not he plays in Saturday’s game remains a mystery. Saban said Wednesday that the starting defensive end, who was shot in the left forearm late Monday night, expressed interest in playing against the Hokies. Deaderick was released from the hospital Tuesday afternoon and participated in Wednesday’s practice wearing a black non-contact jersey and a while sleeve covering his wound. It was quite surprising to see Brandon Deaderick on the practice field this afternoon. It was, after all, fewer than 48 hours after he was shot in the arm in an attempted robbery. The defensive end was wearing a black non-contact jersey and participating in drills during the brief media viewing period. He had a while sleeve covering his left arm that took the bullet late Monday night at an off-campus apartment complex. Check back later for video of Deaderick at practice. A news release sent earlier today from the Tuscaloosa Police Department said they were still searching for a suspect in the shooting. Earlier today coach Nick Saban said he didn’t expect Deaderick to play in Saturday’s game with Virginia Tech, but that will surely come up again this evening when the coach meets with reporters for the final time this week. In other news, Cory Reamer was also practicing today for the first time this week after battling the flu. I did not see Darrington Sentimore out there which would be his fourth missed practice with the flu since Saturday. Read more in Wednesday’s paper, but we were able to speak with a few of Brandon Deaderick’s teammates following Tuesday’s practice. He went on to talk about his friendship with Deaderick. Again, read the full story in Wednesday’s paper. Here’s to hoping no more news will break tonight. Less than 24 hours after being shot in the arm in an attempted robbery, Alabama defensive end Brandon Deaderick has been released from DCH Hospital, spokesman Brad Fisher said. The Elizabethtown, Ky., native was released at 4 p.m. Tuesday. Unfortunately, there isn’t much to report at this time. A Tuscaloosa police spokesman just said that the investigation into the shooting of Brandon Deaderick has not turned up any suspects yet. Thus, an arrest is not immanent. Tuscaloosa cops are looking for a black male 5-feet, 9-inches tall weighing about 140 pounds wearing a black shirt with gold lettering with a dark ball cap and a dark bandanna. Practice begins in about 40 minutes so I will be heading over to the campus for our media viewing period. I will update afterwards if anything new were to come out. Players are scheduled to meet with reporters following the 3:30 p.m. workout so stay tuned for anything they may say. Nothing major to report, but coach Nick Saban just made a statement on the Brandon Deaderick shooting distributed by university media relations. DCH Hospital spokesman Brad Fisher just told The Decatur Daily that Brandon Deaderick is still in “good condition” and could be discharged as soon as today. The gun shot wound to his arm suffered last night never required the defensive end to spend time in the intensive care unit. Fisher said he was moved from the emergency department to a regular room at some point in the night. So, Alabama fans, it appears as if you can take a giant deep breath. This certainly could have been much worse. Check back for any further updates. To this point, the university has not said anything but phone messages have been left for official comment. Stay tuned for that. It’s now after 8 a.m. so information is available. I just got off the phone with a Tuscaloosa police spokesman who was able to pass on the following. The victim (Brandon Deaderick) and an acquaintance were getting out of a vehicle at the Rivermont Apartments on Marina Drive when they were approached by a man who “demanded property.” Deaderick was then shot one time in the arm. He was then taken to DCH Hospital with “non-life-threatening” injuries. The incident was reported between 10:40 and 10:54 p.m.
Police are looking for a black male 5-feet, 9-inches tall weighing about 140 pounds wearing a black shirt with gold lettering with a dark ball cap and a dark bandanna. The on-going investigation is a joint effort between the robbery and metro homicide units of the Tuscaloosa Police Department. The homicide unit investigates all shootings, fatal or otherwise. Stick with the Bama Blog for further details. TUSCALOOSA, Ala. — University of Alabama defensive lineman Brandon Deaderick was taken to a hospital after being shot in the arm during an apparent robbery attempt in Tuscaloosa, the city’s police chief said. The shooting happened Monday night at an apartment complex. Tuscaloosa Police Chief Steve Anderson told the Tuscaloosa News the player suffered a gunshot wound to the forearm. Anderson said the injury is not life-threatening. The player was in the parking lot at the complex at about 10 p.m. when he was approached by a man wearing dark clothes, a dark ball cap and a blue bandanna over his face, the chief said. Deaderick did not know the man, who pointed a gun and said “Give it up,” Anderson said. When Deaderick refused, the assailant fired the gun, striking the player in the arm, the chief said. Police were searching for the shooter. DCH Hospital spokesman Brad Fisher told the Mobile Press-Register that Deaderick was in good condition and was admitted for the night to a hospital room. Deaderick, a 6-foot-4, 306-pound defensive end from Elizabethtown, Ky., started all 14 games last season as a junior. He made 36 tackles last season and was second on the team with four quarterback sacks. Details are still sketchy here at 1:04 a.m. CST, but we know Alabama football player Brandon Deaderick was shot Monday night. A spokesman from DCH Hospital confirmed Deaderick was being treated at the facility on University for injuries reportedly not life threatening. 1:21 a.m. UPDATE: The Mobile Press-Register is reporting Deaderick is in “good” condition. Along with another Alabama beat writer, I was asked to leave the DCH parking lot while seeking a Deaderick’s status. Authorities on the scene at the Rivermont Apartments who appeared to be collecting evidence did not have any details on the investigation of what multiple news sources are calling a robbery and shooting. Deaderick, a defensive end from Elizabethtown, Ky., started all 14 games last season and was listed as a starter on the depth chart released Monday afternoon. For other news reports click here and here. Check back later, but from multiple phone calls made to local authorities, there won’t be much to report until Tuesday morning.